Sometimes I meet a couple and the magic between them is very obvious. This was the case last Saturday with a local couple whose wedding I performed at MSC. I don't usually take this many people to MSC but Smith Cove was full of bathers, and sunbathers so I was glad for the privacy MSC provided. A quiet moment at the end of the day to reflect on being Mr & Mrs.
Ceremony by Joy of Weddings for Cayman Weddings. Photography by Dubadah Boldeau. Wedding bouquet designed and supplied by the bride. 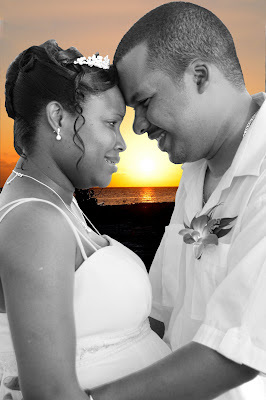 Cayman Weddings is the company of choice for resident weddings, we have been in business continuously for 25 years. Call us at (345) 9498677 or drop in to our office at Suite 205B, Centennial Towers. West Bay. Office hours M- F, 9 am - 3 pm. Book your Saturday wedding early to avoid disappointment.